Like vinyl, gel-coat fiberglass (polyester resin) is a UV-sensitive plastic. Though manufacturers add UV stabilizers to vinyl and gel coat fiberglass in the manufacturing process, these protective agents weaken over time and must be replenished if continuing UV protection is desired. Colored gel-coat fiberglass is particularly sensitive to UV degradation, and 303 Protectant is by far the easiest way to make colored fiberglass look like new again, and to keep it that way. 303 Protectant works by penetrating to restore like-new color and gloss. Spray on enough 303 to thoroughly wet the surface (303 goes farther if it’s sprayed on and then rubbed around & in). Wipe away excess with a soft, absorbent cloth. Wipe until completely dry, changing cloths as they become damp. Unlike wax, 303 is not left to dry before it is wiped off. 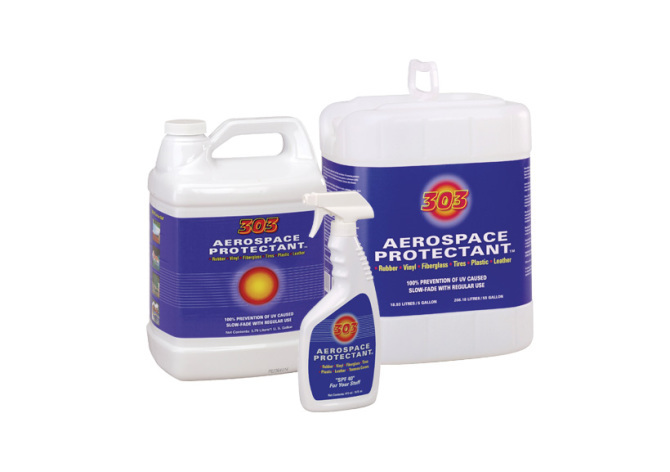 If 303 has dried on the surface, it is easily removed by spraying the area with more 303, then wiping dry.